Delivered flat-packed for easy storage. Integration of the MCA takes minutes! Smooth surfaces with all areas easily accessible for cleaning. 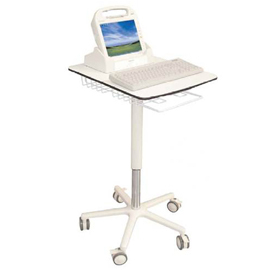 Height-adjustable for use whilst sitting or standing. High-performance, impact resistant table top. demands of a busy work environment. Secure fixing points for the MCA’s docking station.